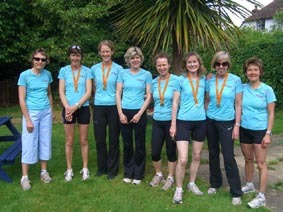 Two ladies’ teams of four were entered for this trail run along the South Downs Way. The race started at Slindon College and finished at Queen Elizabeth Country Park near Petersfield, with three change-over points along the way, which added the extra challenge of driving the team members between the different points. The route was tough but scenic, and both teams managed to find their way and each other without too much difficulty. Mel’s Merry Milers finished the marathon course in 3 hours 59 minutes, and Mel’s Extra Milers in 4 hours 8 minutes, giving them overall positions of 45th and 52nd out of 81 teams. The eight girls enjoyed the race and well deserved lunch on the way home, and are hoping to be back next year.